Advanced Threadform Technology - Less torque required. Blue Climaseal (R) Long life coating. Fast / easy installation and Removable. 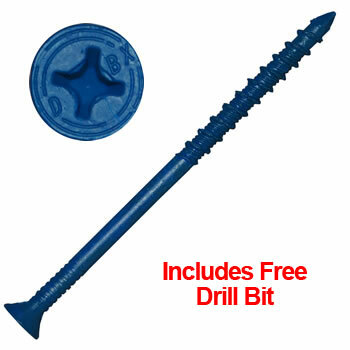 Free Drill Bit in every box! Made in USA. (HH3134) 3/16x1-3/4" TAPCON Hex Head Masonry 100 Ct.
(HH3214) 3/16x2-1/4" TAPCON Hex Head Masonry 100 Ct.
(HH3314) 3/16x3-1/4" TAPCON Hex Head Masonry 100 Ct.
(PFH3134) 3/16x1-3/4" TAPCON Phillips Masonry Flat Head 100 Ct.
(PFH3214) 3/16x2-1/4" TAPCON Phillips Masonry Flat Head 100 Ct.